It is a wonderful thing to be part of the family of God. We have the opportunity to share our burdens, difficulties, prayer requests and answers to prayer! God links us through His Spirit and creates such a love for one another when we walk with Him. It is important that as a family we help one another when we can. We need to pray for one another regularly. We need to help each other out tangibly with things when the need arises. One thing we have to be careful to balance however, is that though we should help others when they really need it, we mustn’t enable them to become lazy or idle. Tolerating either is not helping. It is causing others to become dependent on us for things they should be working towards themselves and leaning on God for. I’m not talking about legitimate needs. If a brother or sister has no family to help them or through some difficult unforeseen circumstance finds themselves in a bind and needing occasional help that is different than relying on others to take care of things they should be doing for themselves. If they are able bodied and find themselves relying on others on a regular basis, it’s time to change their circumstances. Perhaps cut out things in their life that they can’t afford. They may need to take on a second job. Cut back on expenses that are not necessary. Go back to school and get an education. Seek out free financial counselling offered by community service programs. 11 We hear that some among you are idle and disruptive. 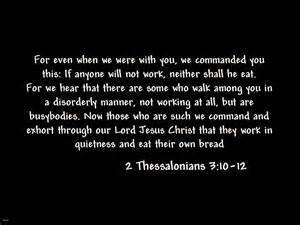 They are not busy; they are busybodies.12 Such people we command and urge in the Lord Jesus Christ to settle down and earn the food they eat. 13 And as for you, brothers and sisters, never tire of doing what is good.14 Take special note of anyone who does not obey our instruction in this letter. Do not associate with them, in order that they may feel ashamed. 15 Yet do not regard them as an enemy, but warn them as you would a fellow believer. This was not said to shame people with legitimate needs that needed help! This is to remind each and every one of us that we have an obligation to work in whatever way we can to support ourselves and not be totally dependent on others for our food and shelter. If we are able bodied, we need to be working to support ourselves and to help others who are not able to. Ultimately, when we look to others for help it is to help us get on our feet so we can support ourselves and be a blessing to others, not so we can stay dependent on other people’s charity. If you are in a place where you find yourself temporarily needing help, accept it, but don’t forget to actively seek ways that you can become self sufficient. Give to others in ways you can give and take steps towards supporting yourself and/or your family. Don’t give up and become idle depending on others to keep you afloat. In my life, there have been many times my family has had to cut back on things we enjoyed because of financial restraints. We had years without vacations. We didn’t have all the toys many of those around us had. We drove very old cars. We made sacrifices to be able to get our kids dental work done, clothes for school etc.. Never once did God forsake us or not meet our needs, but He did allow us to forgo greeds for many seasons! I am grateful for all the ways He met our needs over the years! I am grateful for times when others have blessed us with help in one way or another! I am also grateful that He has never made it so easy for us that we didn’t have to work hard for what we now have. Ultimately, God wants each of us to carry our weight, in our families and in our church family. Each bringing what he or she can to be a blessing to others! ← Christianity is not a spectator sport!